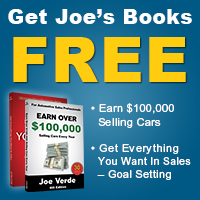 “Joe – before getting in the car business I spent 5 years in security, working a lot of hours and not making a lot of money. In my first 5 months of selling cars I’ve already made way more than my full salary of last year. 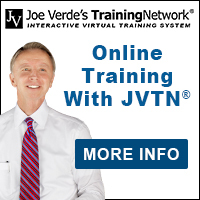 But I was lucky to get into a store that provided the best training out there…your online training on JVTN®. So many times, I hear other salespeople saying that training is a good suggestion or something to try. Joe, your training works 100%, but just ‘trying it’ doesn’t work, it takes a commitment to improve. Since day 1 of starting at the dealership I have been training, practicing, and honing my skills consistently on JVTN®. I watch 6 chapters a day to keep myself believing that the customer is here to buy from me right now. I believe they’re all buyers, just waiting for a professional to lead them through your new buying process. In the last 3 months I sold 45 units and was the top salesperson all 3 months. I was already able to get a Bayliner boat which has been a dream of mine for awhile now. My next goal is to get a new house. And I know I will get it, by following the path to success that you blazed and share in your training.